If he fills up parking lots he's got a lot of room. Decent plan. Frisco's Hall Park has landed its first restaurant — Newk's Eatery — within a soon-to-be-completed development that will bring new dining options to the office park. The Mississippi-based restaurant concept will set up shop in 4,500 square feet at Park Plaza, which is Hall Park's new retail destination. Newk's will anchor the eatery row and be the first of a number of concepts expected to open within the 15,000-square-foot retail property. 12 stories would be the tallest in Frisco? 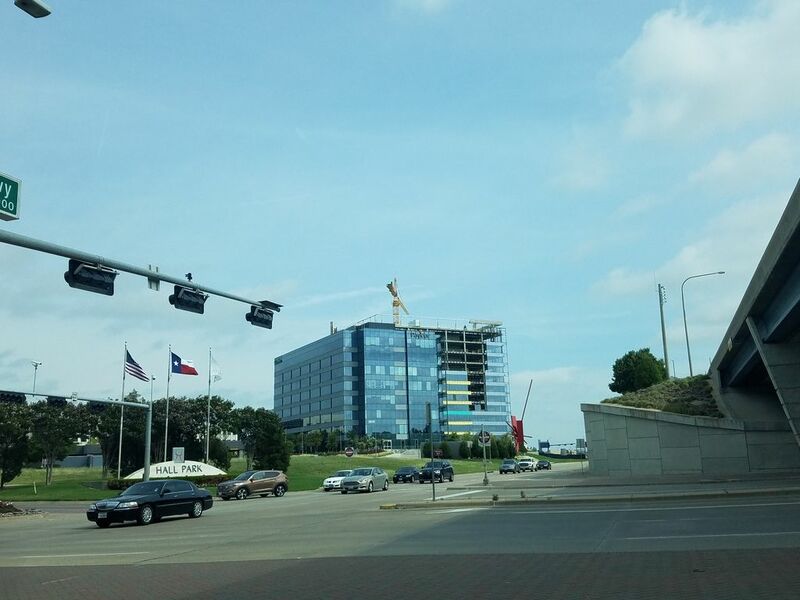 ^Tallest in Hall Office park, the new hotel at The Star is taller. That article and headline are a mess. DBJ should be embarrassed. According to the story, the loan will be used to build a 12-story building. 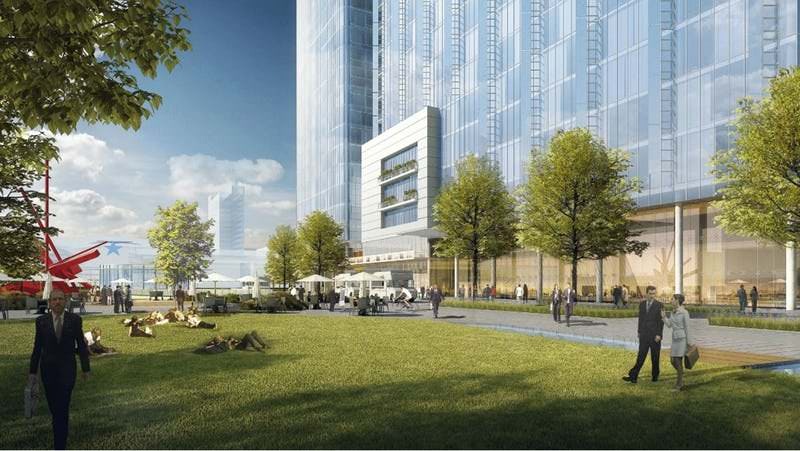 Again, according to the story, the "tallest building in Frisco" will be a 17-story building, already under construction (and apparently not connected to the loan. The headline is false and does not even reflect what the story tells us. That kind of sloppy reporting is why I dropped my pricy subscription. Exciting! There was a LOT mentioned in the article, I took out the most interesting bits and included them in the quotes below. The Star already has a main thoroughfare lined with retail and restaurants leading into the complex's Ford Center...Hall's idea would extend that thoroughfare south of Warren Parkway as a park. Multi-story buildings on either side would have retail and restaurants on the ground floor. Office space or, if the city approves, residential units, would fill out the upper floors. At the end of the park would be the entrance to a new performing arts hall. 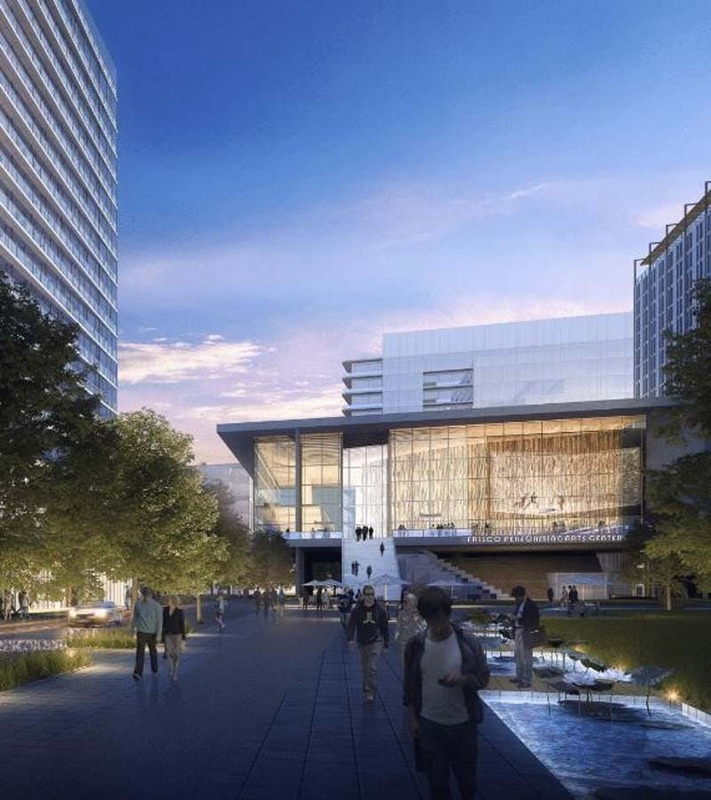 Hall and his team are proposing to update and expand the $450 million, 2.5 million-square-foot Hall Park into a $3.5 billion development with about 8 million square feet. The acreage would remain the same as would the amount of green space. ...they will need the city's approval for taller buildings, especially along the tollway. Parking garages would be built on the lower levels of buildings rather than as separate structures. A few existing buildings would be torn down to make way for newer, bigger ones. They also need the OK to add residential units, which are not allowed under plans now on file with the city. Also, We have some very interesting renderings! They mentioned tearing down some of the older structures and I know the ones they are talking about, They look like white "L" shaped boxes that were built on a whim a while back and scattered all over the park, I'm glad they will be removing them and making way for MUCH nicer buildings. These new buildings will reach up to 25 stories (according to the request for a zoning change) And in the article, it was stated that almost 5.5 Million Sq Ft of Office space was going to be added from new projects totaling over $3 Billion dollars. This would bring the total value of the development to around $3.5 Billion. And the total value of the developments around the coined "5 billion dollar mile", (Without including the now defunct Wade Park) to ~ NINE ~ $9 Billion. Amazing. Also, This is part of the Hall park Masterplan that will take approximately 25 years to complete. Last edited by DAFW on 24 May 2018 17:25, edited 1 time in total. It would be a pretty dramatic transformation if this all comes to fruition. Add to that the "Music City" venue and Alamo Drafthouse going in nearby, and you've got a pretty complete district in terms of office, retail and entertainment. I wonder if at some point a small grocery (ie Trader Joe's) makes sense? I think it's kind of interesting that Frisco and Allen both are done with being typical suburbs - and there is surprisingly little pushback from local residents. Elder statesmen Plano & Richardson are also trying but the pushback is much more organized and they aren't going to be changing further without some real zoning fights. It's also sad the Frisco's minor league park will have the 2nd best connectivity to a neighborhood, behind the AAC and way ahead of anything in Arlington. These two things alone will put this development ahead of most other suburban/urban centers. It's definitely an ambitious project, and I'd imagine this will take years and years to complete, but if they can stick to this plan, this could be a very cool area. The_Overdog wrote: I think it's kind of interesting that Frisco and Allen both are done with being typical suburbs - and there is surprisingly little pushback from local residents. Elder statesmen Plano & Richardson are also trying but the pushback is much more organized and they aren't going to be changing further without some real zoning fights. It's also sad the Frisco's minor league park will have the 2nd best connectivity to a neighborhood, behind the AAC and way ahead of anything in Arlington. Is it possibly because Frisco/Allen are doing a better job of keeping the urban development segregated from existing houses? It seems like people in the suburbs like these urban developments as long as they are far away from their own houses. Or maybe Frisco/Allen have seen the benefits of Shops at Legacy and want the same thing in their cities. Is it possibly because Frisco/Allen are doing a better job of keeping the urban development segregated from existing houses? No not really, Hall Office Park is surrounded by single family. The new developments in Allen are too. Those renderings at Hall look dense, I'd like to see the layout and maybe some different angles. This will certainly make that corner more dense, too bad there isn't anything connecting these four corners.